Warren has over 14 years experience in the investment industry working with high-net worth individuals, businesses owners and retirees to help them achieve their goals. In collaboration with TD specialists, he can provide a full-suite of wealth management services to his clients, including tax, estate, business succession and investment and wealth strategies. His dedication to exceptional client experiences and innovative financial strategies are the foundations of his business. 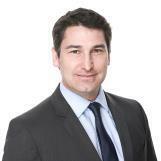 He holds a Financial Management Diploma from the British Columbia Institute of Technology. He and his wife Kathleen and two kids live in North Vancouver. I wanted to take a moment and introduce myself. I was born and raised in Moscow, Russia, where I graduated law school as a civil lawyer specializing in corporate law. I started my career working for the Russian parliament. I moved to Canada in 2010 and was very fortunate to work in the Calgary real estate industry for several years. I have joined TD Canada Trust slightly over 3 years ago. My most recent role was a Financial Services Representative. In June 2018 I joined TD Wealth working with Warren in Downtown Vancouver.